Introducing Alienware M17x, an excellent laptop which is ideally built for gamers and programmers who work with high graphic applications. The most amazing feature of this unique laptop is that it has two NVIDIA GeForce graphic card of type GTX 280M with a RAM of 1GB. 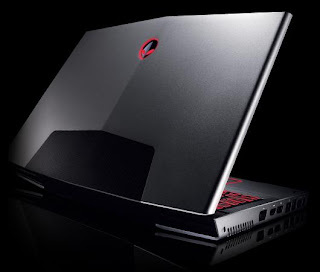 The users of the Alienware M17X gaming laptop are able to shift to onboard NVIDIA GeForce 9400M GPU if they wish to make further modifications. An inimitable feature of the Alienware M17x is that it supports quad-core 2 Extreme for its processing and has an excellent RAM of up to 8 GB of type DDR3. That’s not all! Alienware M17x has an unbelievable hard drive space which can be expanded up to 1 Terabyte. Alienware M17x features some prime features like 9 cell battery for better battery backup and long life, USB 2.0 connection, eSATA and ExpressCardports, WI-Fi connection of type 802.11n, in-built 8 in 1 card reader for easy data transfer from memory card to laptop, the latest blu-ray player of type dual layer, excellent bright display LCD screen with resolution of 1920 x 1200 and Display Port and HDMI outs by which the users can connect it to any display. This amazing gaming laptop comes with stylish compact design and weighs just 11.68 pounds. In spite of such unique features and high competing technology the Alienware M17x laptops are available for a starting price of just $1799, rising to around $5000 for high-end models.